It is very rare that a film touches the pulse of American culture, Ford’s Depression-era The Grapes of Wrath (1940) and the postwar malaise of Wyler’s Best Years of Our Lives (1946) come most readily to mind; Up in the Air belongs in this category. Director Jason Reitman unapologetically shows a side of American life that is sort of hushed up in Hollywood: the Great Recession, and its palpable effect on the middle class. He spends time and care demonstrating the human toll of lay-offs; shots of empty offices, foreclosed homes, and terrified recent fires is brave cinema and almost worth the price of admission. 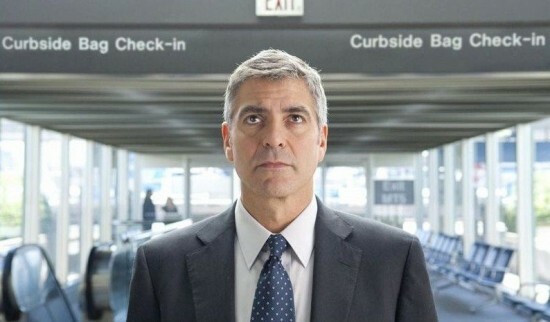 Up in the Air tells the story of Ryan Bingham (George Clooney) who fires people for a living. He travels constantly, touching down in city after city, accruing frequent flier miles while carrying out his grim task. His life changes upon meeting Natalie Keener (Anna Kendrick) whose method of firing via computer hook-up will soon put him out of business. He must convince her of the benefits of in-person canning during a wild tour of the country, touching down at all sorts of Midwestern hot spots. They are accompanied at times by his no-strings-attached girlfriend Alex Goran (Vera Farmiga). The movie culminates in the wedding of Ryan’s sister Julie (Melanie Lynskey) and Jim (Danny McBride); as Ryan comes to renew links with family he begins to question his frequent-flier life and muses over being grounded for life. Reitman tackles contemporary issues that other directors are too cowardly to confront. This is a movie about America unashamed to show its decline. He also lays bare some of the more delicious ironies of the twenty-first century; while Natalie introduces a system of firing via web, she bristles at being dumped via text message in a truly funny scene. However connected the twenty-first century, alienation in the form of one-night stands, bland hotels, and text messages litter Ryan’s meaningless existence. Ryan’s “Empty Backpack” philosophy becomes something of a mantra for this century; simplify your life down to a Kindle and a Blackberry and say goodbye to your identity too. While the movie’s themes are weighty and the acting is spectacular, the plotting feels more plodding than fresh. The story drags by the end and the addition of several unnecessary scenes gives this film too many delays. Certain characters lead nowhere, other twists are rendered meaningless and unjustified by the end. Why do we need a five-minute scene of Ryan, Natalie, and Alex enjoying themselves at a tech conference? Couldn’t that have been downsized? Yet the subject matter is so rich that even without a great ending, this movie still soars. It is a delicious look at American culture and one worth watching while in theaters. This entry was posted in Uncategorized and tagged george clooney, quickie review, ryan bingham, up in the air. Bookmark the permalink.